Tariffs put in place by the Trump administration have led to a slowdown in food trade with countries overseas. As a result, farmers and food producers are seeing a surplus in product. 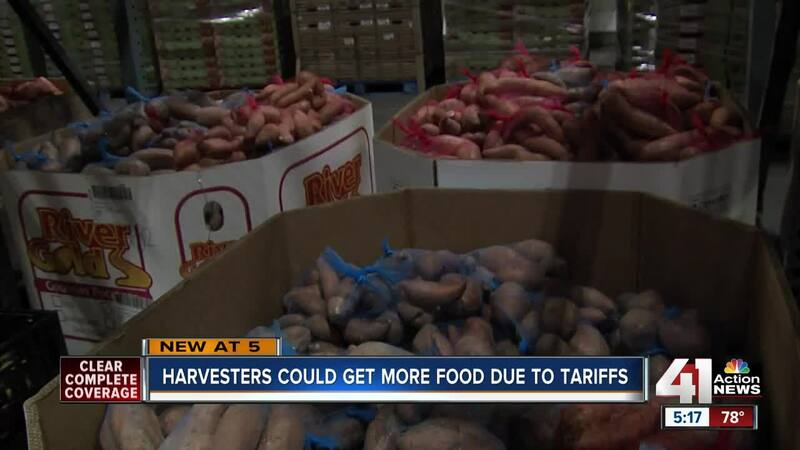 At the Harvesters Community Food Network in the metro, organizers told 41 Action News that they expected to receive around a million more pounds of food as a result of the tariff impact. Davis said the food surplus would result in the food banks being able to offer more options for people in need. “We’ll be able to offer a variety of different kinds of pork product, apples, we’re getting some dried beans,” he said. While the extra food supply will help feed more people, Davis added that the extra food comes with a cost. He estimated that the million pounds of extra food could end up costing Harvesters around $170,000. The surplus food situation has been made easier on U.S. farmers thanks to a government bailout. With the extra food now on supply, the government contributed $1.2 billion for the food not sold overseas. That food will now be sent to food banks all across the country. As the “trade war” continues to evolve around the world, Butler told 41 Action News that farmers and food producers in the metro and Midwest region could see even more impacts. While the future of the tariffs remains uncertain, Harvesters said the surplus food this year would help address a big need in the area. Harvesters expects to receive the surplus food between this month and March next year. For more information on Harvesters food assistance, visit this link .